LVM initial set up is not available during text-mode installation. If you need to create an LVM configuration from scratch, press Alt+F2 to use a different virtual console, and run the lvm command. To return to the text-mode installation, press Alt+F1. Logical Volume Management (LVM) presents a simple logical view of underlying physical storage space, such as a hard drives or LUNs. Partitions on physical storage are represented as physical volumes that can be grouped together into volume groups. 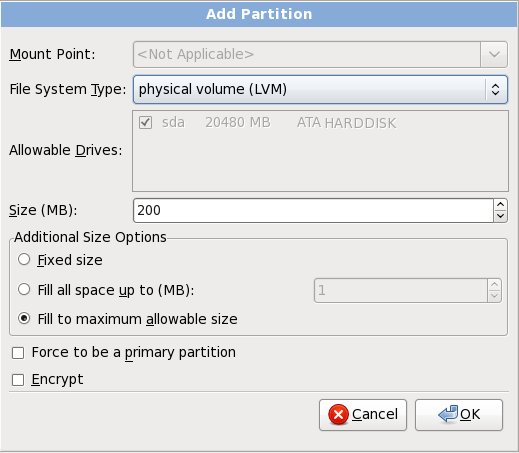 Each volume group can be divided into multiple logical volumes, each of which is analogous to a standard disk partition. Therefore, LVM logical volumes function as partitions that can span multiple physical disks. To read more about LVM, refer to the Red Hat Enterprise Linux Deployment Guide. Note, LVM is only available in the graphical installation program. Choose this option to create LVM volume groups from the available LVM physical volumes, or to add existing logical volumes to a volume group. To assign one or more physical volumes to a volume group, first name the volume group. Then select the physical volumes to be used in the volume group. Finally, configure logical volumes on any volume groups using the Add, Edit and Delete options. You may not remove a physical volume from a volume group if doing so would leave insufficient space for that group's logical volumes. Take for example a volume group made up of two 5 GB LVM physical volume partitions, which contains an 8 GB logical volume. The installer would not allow you to remove either of the component physical volumes, since that would leave only 5 GB in the group for an 8 GB logical volume. If you reduce the total size of any logical volumes appropriately, you may then remove a physical volume from the volume group. 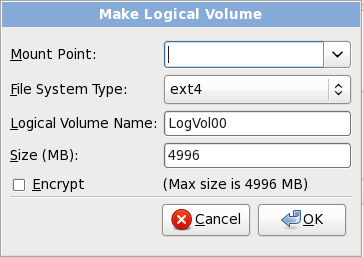 In the example, reducing the size of the logical volume to 4 GB would allow you to remove one of the 5 GB physical volumes. 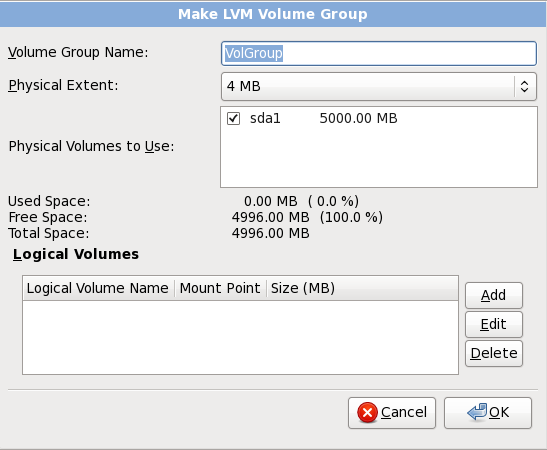 Choose this option to create an LVM logical volume. Select a mount point, file system type, and size (in MB) just as if it were a standard disk partition. You can also choose a name for the logical volume and specify the volume group to which it will belong.